For this week’s challenge, we see “Love in the Air”. I used a fun digis from Bugaboo Stamps called, “Wee One Bugs – Snail.” I coloured it with Copic markers, layered it on patterned card stock, and added a few butterflies I had in my stash. Please join us. Please support all our supports who generously provide all our wonderful prizes. Black Pearl Kirarina Wink Glitter Pen Review CANCELLED due to Dog! My dog just had a fight with a Black Pearl Kirarina Wink Glitter Pen and lost! I purchased the dogs (I also have a Westie) a monthly “Bark Box” subscription for Christmas, and inside the December box was a wonderful stuffed natural bone. While I was busy labeling my stamps and dies, Taylor was busy in his dog bed chewing on his bone…or so I thought. But no! he somehow lifted my new glitter pen from the shipping box and was chewing on it instead. Results: Taylor and dog bed 0, glitter pen 10. While I tried to remove the remnants left behind with a through bath, I think I will have to wait until his beard grows out. As for the dog bed, time will time as it is in the wash. Stupid dog! He is so proud of himself…go figure-yummy dog bone or glitter pen??? Stupid Dog-cute and adorable yes! but still stupid dog! You can see by this image. Taylor should have a white muzzle! Now I have to order another pen! Welcome to our mid-month challenge. 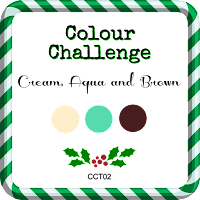 For this challenge, we are asking you to design a Christmas card using cream, aqua and brown. I started my card by blending my background strip using distress inks – peacock feathers and vintage photo. Once that was done I stamped various snowflakes for my stash in the same ink. I trimmed to strip to fit a A2 cream coloured card. Next I cut 4 thin strips of aqua and brown card stock and edged the snowflake strip. I die cut snowflakes using dies from Lawn Fawn and Paper Smooches in cream, aqua, and brown card stock. The sentiment is from Papertry Ink. I hope you will join us! Remember it is never too early to start on your Christmas card stash. I know Christmas just passed, but it is never too early to start your Christmas cards, I make over 250 Christmas cards each year so starting in January works for me. One of my favorite Digi Stamp companies is “A Day for Daisies“. They have a vast variety of digi stamps and their Design Team always have fantastic samples online. Check them out! When I think of Christmas, I think aboiut shopping! (Another thing I like to start doing early). I use a beautiful stamp called, “Tiny Fashionable Present“. While I used this digi as a Christmas card, it could easily be a Birthday, Anniversary, Valentine or Just Because card. I coloured the image with Copics. I layered it with similar aqua tones. The “Joy” sentiment is a die cut from Creative Expressions Festive Collection – Joy Die Set by Sue Wilson. To finish it off I added a few gems for that added bling. Please join us for this challenge, and make sure to check out A Day for Daisies! Support our Sponsors who generously provide our wonderful prizes! This challenge will last for the whole month of January 2017 - anything goes as long as it’s Christmas - it doesn’t have to be a card, you can link any project as long as it’s Christmas! This is my mid-month post and you have until the end of the month to join us! 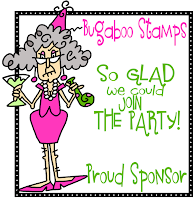 I love Bugaboo Stamps. The stamp below was called Santa’s Window. I say “was” because it has been retired. Jodie has so many digis stamps available on her site that time to time she will retire old images to make room for the new. So I would suggest check out her site often. She regularly has sales, posts new stamps each week, and offers a new freebie each Friday! I coloured the Santa in the window with Copic markers, fussy cut him out and layered him with various Christmas card stock pieces I had on my desk.